With iPads being one of the top selling gadgets of all time, it’s no surprise they have made their way into schools wireless networks. 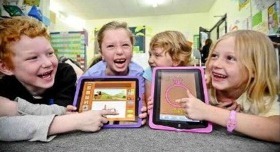 Before we know it every school will be filled with the interactive benefits of the iPad. While many schools aren’t wasting any time integrating this effective classroom technology, some are still a little leery about how to utilize the iPad for education. There are over a hundred of great ways to use them in your school and everybody has their own method or preference. 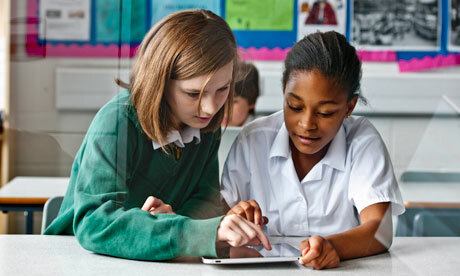 So, let me get you started with 3 iPad usages that can benefit students in your school. 1. No more heavy textbooks! If for no other reason than to replace those back-breaking textbooks, having the iPad in school is worth it. I will never forget how awful it was to lug around that hefty backpack to and from and around school. And trying to remember which books to bring home, well that was another issue of its own. The lightweight iPad is a lot healthier for children’s backs, saves trees, and is definitely a more economical alternative. Textbooks are very costly and most change editions annually. Now, with the iPad students can have all their textbooks in one place and easily accessible for a fraction of the cost. Also, students can highlight and write digital notes with their iPad without damaging the books so they will be in new condition forever. There is a limitless amount of information available through this great wireless classroom technology. iPads allow students to access tons of reference apps for facts, questions, statistics, articles, dictionaries, data, and much more. All of this is available quicker and better than ever before. Imagine looking up types of volcanoes and instead of just a list you get exciting interactive videos. Students can now have more information and better quality content at the tips of their fingers. Put down the textbook and flash cards and play a game, that’s what every kid wants to hear. Turning study time into an exciting game makes students actually want to study! There are many apps out there that can be downloaded for various subjects that allow a more interesting and fun approach to studying. Some apps will also keep up with your progress and assess the areas that need the most improvement giving parents and teachers a progress report on the student. These are just 3 of the many benefits of the iPad coming to your schools wireless network. Such a valuable learning tool should be utilized at all schools. As the demand for wireless devices like the iPad in the classroom continues to rise, your school wireless network needs to be prepared to support it. That’s where we can help. Here at SecurEdge Networks, we can help by designing a secure school wireless network that doesn't just support the amount of current devices, but future proof the wireless plan to keep future wireless levels in mind. We have designed outdoor and indoor wireless networks across school campuses throughout the United States. Contact us today for a Free Wireless Network Design for your school or download one of our Free guides.